Homemade enchiladas are one of my favorite dinners. Up until now, my go-to recipe has been aunt Jolene’s sour cream chicken enchiladas, which are outstanding. However, flour tortillas, Monterey Jack and Cheddar cheese, sour cream, and butter aren’t exactly calorie friendly. 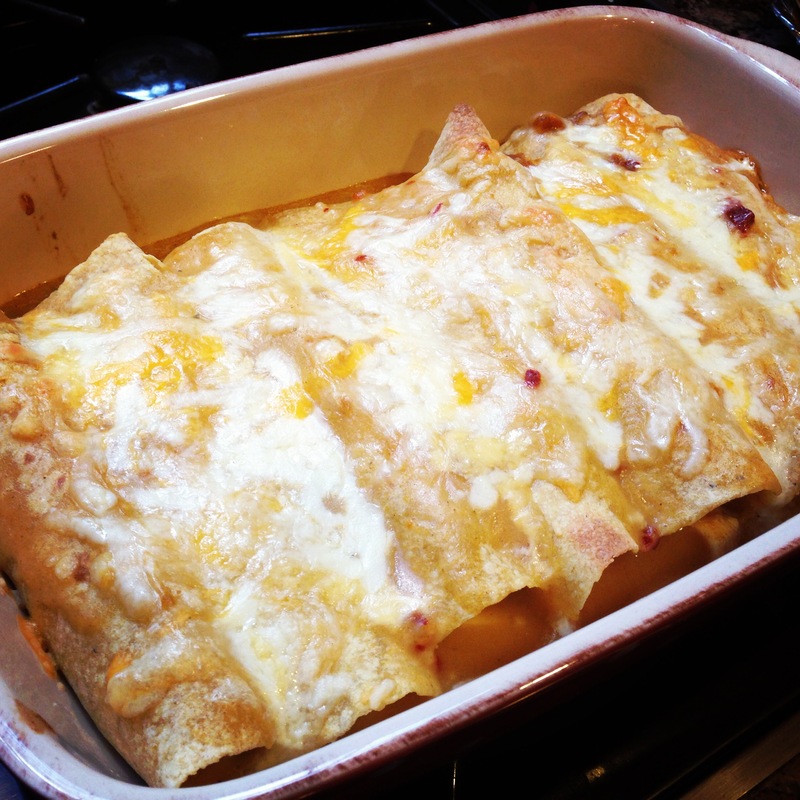 A few weeks ago my sister and mom discovered a new, lightened-up chicken enchiladas recipe that I just had to try. While there’s no butter or sour cream in these, they definitely do NOT lack flavor. Two tablespoons of chipotles in adobo (dried chiles from smoked jalapeños) don’t sound like much, you’d be surprised! If you’re not very tolerant of spicy foods, you might want to scrape out the ribs and seeds. With that said, the chipotles in adobo add a wonderfully rich smokey flavor that create an authentic-tasting Tex-Mex chicken enchilada dish. 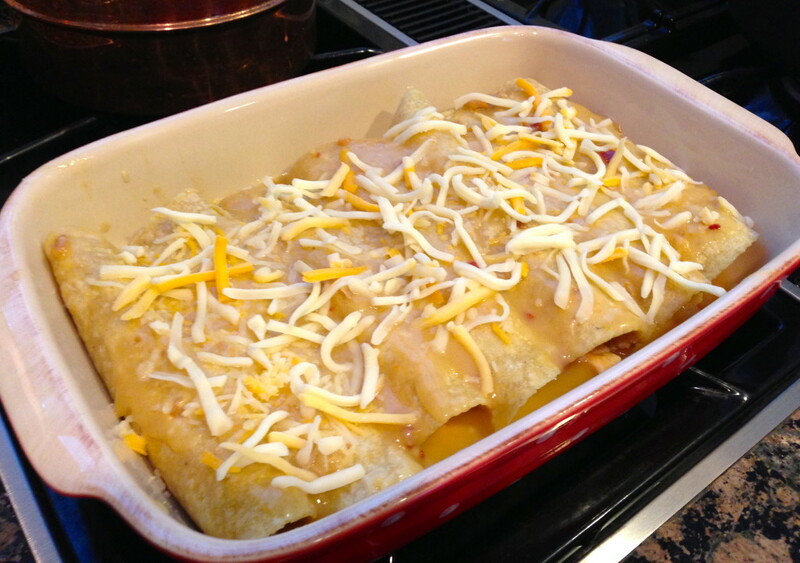 If you have a Central Market anywhere near you, you MUST try their homemade corn tortillas for these enchiladas. I’m not a huge fan of corn tortillas (I’d take flour over corn any day of the week), but Central Market’s corn tortillas blew me away! Not only are they fresh out of the oven, they are slightly larger than your typical corn tortilla and they don’t crack like the regular pre-packaged ones. I really think these tortillas “made” the dish for me! Serve hot and enjoy immediately. To brown the cheese a little more, you can set these under the broiler on high for about 30 seconds to 1 minute. In a large skillet with a tight-fitting lid, bring 1 inch salted water to a boil. Add chicken. Cover; reduce heat to medium-low. Simmer 5 minutes; remove skillet from heat. Let chicken steam, covered, until opaque throughout, 12-14 minutes. Transfer chicken to a medium bowl; shred with two forks. Set aside. While chicken is cooking, make sauce: In a medium saucepan, heat oil over medium. Add garlic; cook until fragrant, 1 minute. Add flour, cumin, and chipotles in adobo; cook, whisking 1 minute. Whisk in broth and ½ cup water; bring to a boil. Reduce to a simmer, and cook, whisking occasionally, until sauce has thickened slightly, 5-8 minutes; season with salt and pepper. Transfer 1 cup sauce to bowl with chicken; toss to combine. Preheat oven to 400 degrees F. Pour ¼ cup sauce into bottom of an 8-inch square baking dish; set aside. Stack tortillas, and wrap in a double layer of damp paper towels; microwave until hot, about 1 minute. Fill each tortilla with chicken mixture; roll up tightly, and arrange, seam-side down, in baking dish. Cover with remaining sauce, and top with cheese. Bake until hot and bubbling, 15-20 minutes. Let cool 5 minutes before serving. Chipotles in adobo (smoked, dried jalapeños in sauce) are spicy - for less heat, scrape out the ribs and seeds. You'll find them in the international aisle.